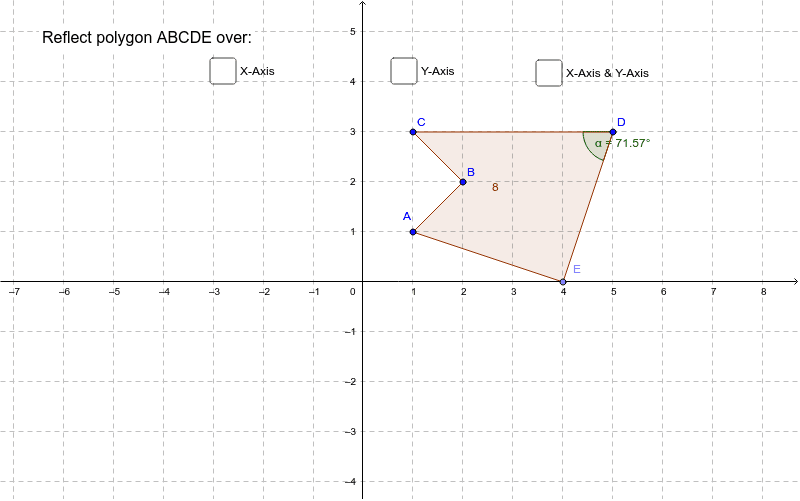 Use the check boxes to see what happens when you reflect pentagon ABCDE over the x-axis, y-axis, and x- and y-axes. Pay attention to how the coordinates of specific points change! 1) What are the coordinates of B (2,2) after it is reflected over the y-axis? 2) What are the coordinates of E (4,0) after it is reflected over the x-axis? Will this always be true for points on the line of reflection? 3) What are the coordinates of D (5,3) after it is reflected over the x- and y-axes? 4) Does reflection change the length of segments? The measure of angles? The area of the shape? 5) Can you write a general rule for reflecting over the x-axis? The y-axis? Both x- and y-axes?